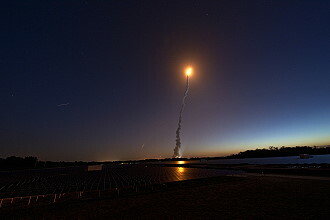 Launch from Cape Canaveral (KSC); landing at Cape Canaveral (KSC), Runway 33. The primary payload of STS-131 (ISS-MPLM Leonardo) was a Multi-Purpose Logistics Module loaded with supplies and equipment for the International Space Station. The mission also removed and replaced an ammonia tank assembly outside the station on the S1 truss. 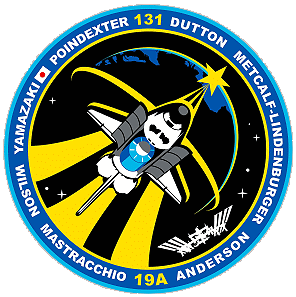 STS-131 furthermore carried several on-board payloads; this mission had the most payloads since STS-107. 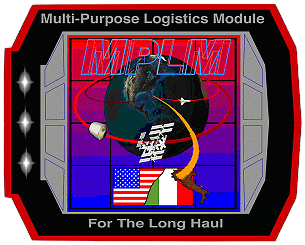 The MPLM also carried the third and final Minus Eighty Degree Laboratory Freezer for ISS (MELFI), Window Orbital Research Facility (WORF), one Crew Quarters Rack, the Muscle Atrophy Resistive Exercise (MARES) rack, Resupply Stowage Racks (RSRs), as well as Resupply Stowage Platforms (RSPs). As the last round-trip for the Leonardo Multi-Purpose Logistics Module, Discovery's mission provided the International Space Station with not only some 8 tons of science equipment and cargo, but also one last opportunity to send a large load of cargo back to the ground. Leonardo served as basically a moving van for the space station, allowing the shuttle to, first of all, deliver shipments of equipment and supplies larger than any other vehicle could accommodate, and, second, to return science experiments, unneeded hardware and trash to the ground - all other cargo transfer vehicles burn up in the Earth's atmosphere. 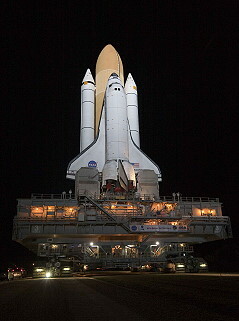 And although Leonardo returned to the station once more on the last space shuttle mission later in 2010, this was scheduled to be its last round trip - Leonardo remained permanently at the station after STS-133. 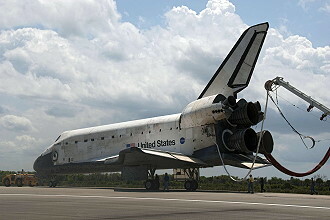 So while it delivered one more batch of goods, the cargo returning on STS-131 was the last that it brought home. The Lightweight Multi-Purpose Equipment Support Structure Carrier (LMC) carried a refurbished Ammonia Tank Assembly (ATA) to the ISS. 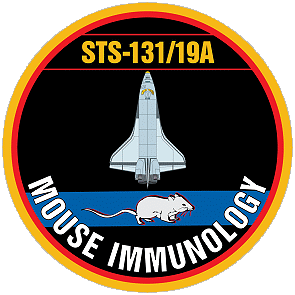 The refurbished ATA was removed from the Space Station and returned for use on this mission during STS-128. It was swapped with an empty tank which will ride home on the LMC. This mission was the second flight of the TriDAR, a 3D dual-sensing laser camera, intended for potential use as an autonomous rendezvous and docking sensor. TriDAR provides guidance information that can be used to guide a vehicle during rendezvous and docking operations in space. TriDAR does not rely on any reference markers, such as reflectors, positioned on the target spacecraft. To achieve this, it relies on a laser based 3D sensor and a thermal imager. Geometric information contained in successive 3D images is matched against the known shape of the target object to calculate its position and orientation in real-time. 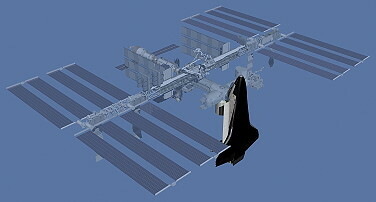 The TriDAR tracked the ISS position and orientation from the shuttle during docking, undocking, and flyaround operations. Shortly after launch the shuttle Discovery's Ku-band antenna system, used as a radar dish during rendezvous operations and to transmit video and data to and from the ground through NASA communications satellites, suffered a malfunction of some sort. Loss of the antenna operations did not impact mission safety or success. Discovery made a safely rendezvous and docked with the station and successfully completed all of its planned mission objectives without use of the Ku-Band antenna, if needed. 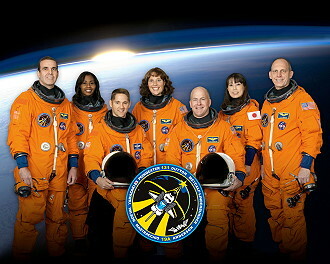 The seven person crew of STS-131 was awakened to begin their first full day in space on Flight Day 2. Due to the lack of Ku-band communication, changes to the crews daily plan were read up for them to write out. After their post sleep activities, commander Alan Poindexter and pilot James Dutton fired Discovery's Orbital Maneuvering System (OMS) engines to correct and further refine the shuttle's path to the ISS. Astronauts Naoko Yamazaki and Dorothy Metcalf-Lindenburger began activating and checking out the Shuttle Remote Manipulator System (SRMS) also known as the Canadarm. While Dorothy Metcalf-Lindenburger and Naoko Yamazaki were working with Canadarm, Stephanie Wilson was getting equipment together and set up to record the inspections of the shuttle's heat shield. The inspections were recorded so they could be downlinked to the ground once docked to the ISS. Once all that work was done, commander Alan Poindexter and pilot James Dutton joined Dorothy Metcalf-Lindenburger, Naoko Yamazaki, and Stephanie Wilson to conduct the inspection of the shuttle's heat shield. While the inspection was going on, Richard Mastracchio and Clayton Anderson were on the mid-deck of Discovery checking out the Extravehicular Mobility Units (EMU) and getting them ready for their three spacewalks. The last portion of the crew day was spent preparing and checking out all of the tools used during rendezvous. 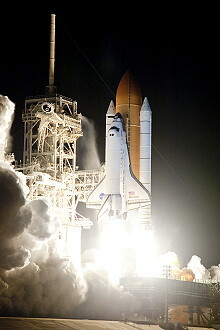 Discovery's launch for the STS-131 mission was precisely timed to lead to a link up with the International Space Station about 220 miles above the earth. A series of engine firings during the first two days of the mission brought the shuttle to a point about 50,000 feet (15,240 meters) behind the station. Once there, Discovery started its final approach. About 2.5 hours before docking, the shuttle's jets were fired during what is called the terminal initiation burn. The shuttle covered the final miles to the station during the next orbit. As Discovery moved closer to the station, its rendezvous radar system and trajectory control sensor provided the crew with range and closing-rate data. Several small correction burns placed the shuttle about 1,000 feet (304.8 meters) below the station. 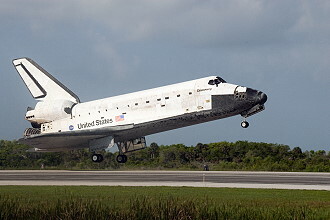 Commander Alan Poindexter, with help from Pilot James Dutton and other crew members, manually flew the shuttle for the remainder of the approach and docking. Alan Poindexter stopped Discovery about 600 feet (182.9 meters) below the station. Timing the next steps to occur with proper lighting, he maneuvered the shuttle through a nine-minute backflip called the Rendezvous Pitch Maneuver, also known as a the R-bar Pitch Maneuver (RPM) since Discovery was in line with an imaginary vertical R-bar directly below the station. During this maneuver, station crew members Timothy Creamer and Oleg Kotov photographed Discovery's upper and bottom surfaces through windows of the Zvezda Service Module. They used digital cameras with an 800 mm lens to provide up to one-inch (2.5 centimeters) resolution and one with a 400 mm lens that provided three-inch (7.6 centimeters) resolution. The photography was one of several techniques used to inspect the shuttle's thermal protection system for possible damage. Areas of special interest included the thermal protection tiles, the reinforced carbon-carbon of the nose and leading edges of the wings, landing gear doors and the elevon cove. The photos were downlinked through the station's Ku-band communications system for analysis by systems engineers and mission managers. When Discovery completed its backflip, it was back where it started, with its payload bay facing the station. Alan Poindexter then flew the shuttle through a quarter circle to a position about 400 feet (121.9 meters) directly in front of the station. From that point he began the final approach to docking to the Pressurized Mating Adapter 2 at the forward end of the Harmony node. 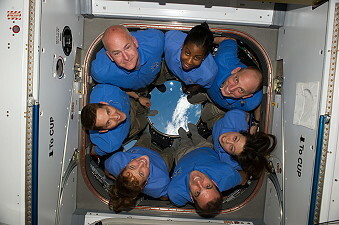 The shuttle crew members operated laptop computers that process the navigational data, the laser range systems and Discovery's docking mechanism. Using a video camera mounted in the center of the Orbiter Docking System, Alan Poindexter lined up the docking ports of the two spacecraft. He pause the shuttle 30 feet (9.14 meters) from the station to ensure proper alignment of the docking mechanisms. He maintained the shuttle's speed relative to the station at about one-tenth of a foot per second (3 centimeters per second), while both Discovery and the station were moving at about 17,500 mph (28,163 km/h). Alan Poindexter kept the docking mechanisms aligned to a tolerance of three inches (7.6 centimeters). When Discovery made contact with the station on April 07, 2010, preliminary latches automatically attached the two spacecraft. The shuttle's steering jets were deactivated to reduce the forces acting at the docking interface. Shock absorber springs in the docking mechanism dampened any relative motion between the shuttle and station. 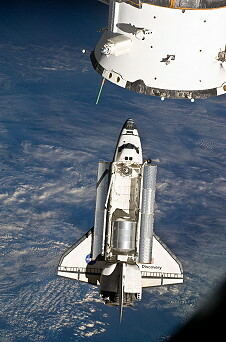 Once Discovery docked to the International Space Station (ISS), a series of leak checks were done on both sides of the hatch by the shuttle and station crews STS-131/Expedition 23. The hatches between the two vehicles were opened at 09:11 UTC (05:11 EDT), which was 30 minutes earlier than planned. Once the hatches were opened the STS-131 crew got a safety briefing from the station crew, then began to transfer items that would be needed for later in the day and early on flight day 4. Two items that were transferred were the two EMUs that will be used for the three spacewalks. The crew also completed a grapple of the Orbiter Boom Sensor System (OBSS) with the Space Station Remote Manipulator System (SSRMS) also known as Canadarm2. Once the OBSS was grappled it was unberthed from the starboard sill of the space shuttle payload bay, and handed off to the SRMS. Throughout the day, after docking to the station, the shuttle crew began downlinking all of the inspection video from flight day 2, and launch imagery and video. 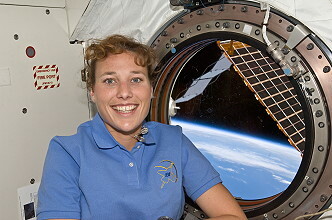 On April 08, 2010 Stephanie Wilson and Naoko Yamazaki grappled and berthed the Multi-purpose Logistics Module (MPLM) Leonardo. The MPLM was berthed to the station at 04:24 UTC (00:24 EDT). 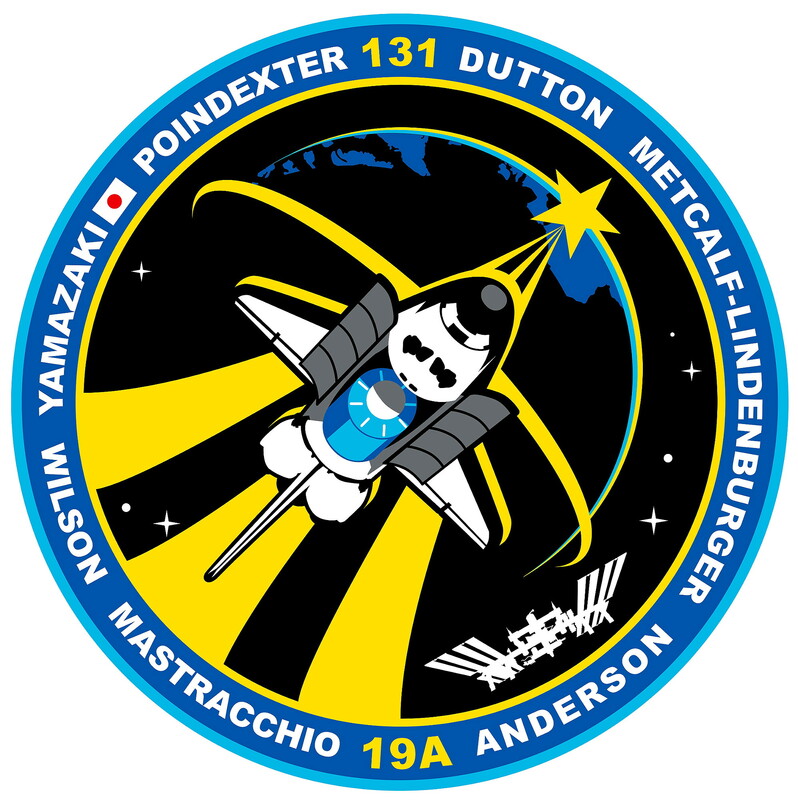 The hatches were opened by station Flight Engineer Soichi Noguchi and shuttle mission specialist Clayton Anderson at 11:58 UTC (07:58 EDT). 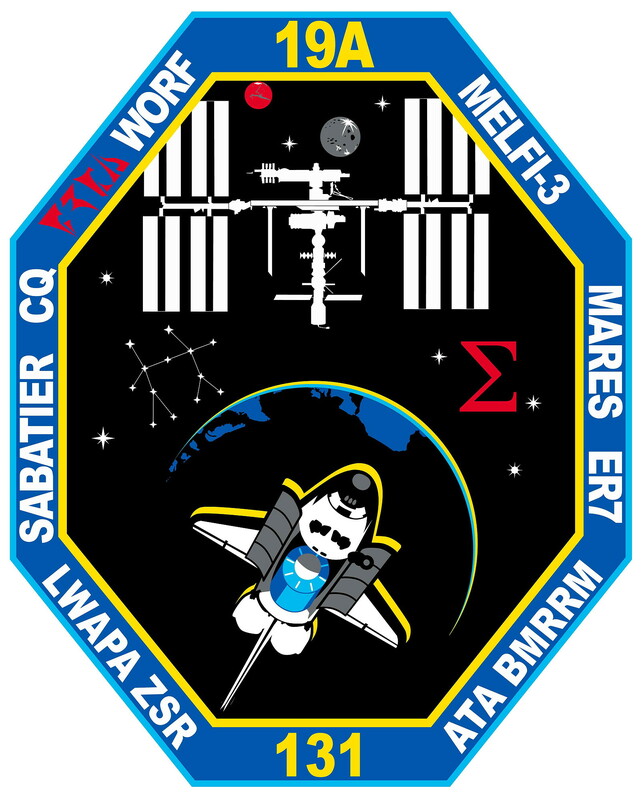 The joint STS-131/Expedition 23 crews began transferring cargo from the MPLM, with the first item being a Rate Gyro Assembly (RGA) which will be replaced on the first spacewalk of the mission. The Italian built module's more than 17,000 pounds (7,711 kg) of cargo included four experiment racks along with the final private crew quarters. This is the final roundtrip to the station for the 21-foot-long (6.4 meters), 15-foot-diameter (4.6 meters) Leonardo. Once back on Earth, the module will be reconfigured with increased shielding on the outside for the STS-133 mission in September 2010 when it will be left on the station as a permanent module. The first EVA by Richard Mastracchio and Clayton Anderson occurred on April 09, 2010 (6h 27m). The crew inside used the station's robotic arm to remove a new ammonia tank from shuttle's payload bay and temporarily stow it on the station. Ammonia is used to move excess heat from inside the station to the radiators located outside. The spacewalkers then retrieved a seed experiment outside the Japanese laboratory. Next, the pair installed a grapple bar to the new ammonia tank on the station's truss. 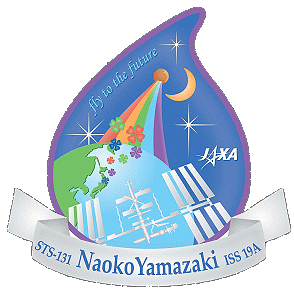 The pair also replaced a failed gyroscope that is part of the station's navigation system. They also accomplished several "get-ahead" tasks, removing 11 out of 12 p-clamps slated for a future spacewalk. The first leg of the ammonia tank assembly swap started in the shuttle's cargo bay. After picking up a handle that the space station robotic arm used to grasp the new tank, Richard Mastracchio moved to the cargo bay and installed it on the new tank then began releasing the four bolts that held it in place during its journey to the station. Clayton Anderson, meanwhile, moved to the station's starboard truss segment and disconnected the old tank's four ammonia and nitrogen lines before meeting Richard Mastracchio in the cargo bay to do the same on the new tank. 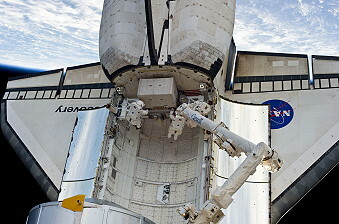 Once the lines were disconnected and the bolts released, Clayton Anderson and Richard Mastracchio worked together to lift it out of the cargo bay and into position for the robotic arm to grasp it and fly it to the external stowage platform 2 on the Quest airlock. 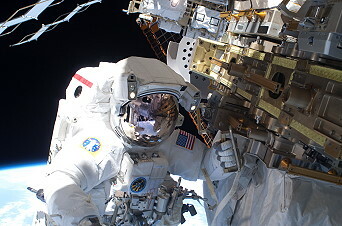 While it made its way there, Clayton Anderson cleaned up their work area while Richard Mastracchio moved to the Kibo laboratory's porch - the Japanese Experiment Module's exposed facility - to retrieve the Micro-Particles Capture/Space Environment Exposure Device experiment and temporarily stowed it outside of the airlock - he moved it inside later in the spacewalk. They met the robotic arm back at the external stowage platform to install another handle on the new ammonia tank assembly, while it was still in the grasp of the arm. This second handle was used to attach the assembly to a temporary storage location on the robotic arm's mobile transporter, where it waited for installation on the second spacewalk of the mission. Once that handle was installed, the robotic arm flew the tank assembly to the storage location, and the spacewalkers moved on to other tasks. The first of the tasks was the replacement of a rate gyro assembly on the center section of the station's truss. While moving the experiment inside of the airlock, Richard Mastracchio retrieved a new rate gyro assembly, then moved to the center of the truss, where Clayton Anderson had removed from inside the truss, two of the four bolts holding the old assembly in place. When Richard Mastracchio arrived at the truss segment, he opened insulation protecting the assembly, disconnected two power cables and released the final two bolts. He then removed the old assembly and slided the new one into place, engaging the first two bolts, connecting the power cables and then engaging the last two bolts. Meanwhile, Clayton Anderson had moved on to their final tasks of the mission: The preparation of the batteries on the farthest port solar array for replacement on a later mission. There are two sets of batteries, and the first set was replaced on STS-127, and some of the equipment used in that work - a gap spanner and a foot restraint - was still in place. Clayton Anderson moved it from the set of batteries replaced during STS-127 to the set of batteries he and Richard Mastracchio were working with. The spacewalker was loosening the 12 bolts holding the six batteries in place before heading back inside the station. Flight day 6 was dedicated to transferring supplies from the MPLM Leonardo and the space shuttle mid-deck. The crews transferred the Windows Observational Research Facility (WORF) to the Destiny lab. 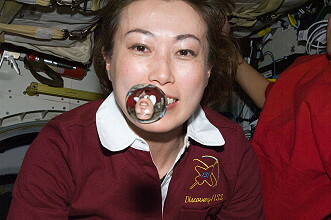 Mission specialist Naoko Yamazaki, along with Flight Engineer Soichi Noguchi also transferred the Express Rack 7 (ER7) to its final location. During the crews morning, a smoke alarm sounded in the Russian segment of the station, which prompted the joint crew to move into emergency procedures. However the alarm was false and was cleared within a couple of minutes and all normal work resumed. Meanwhile mission managers extended the flight by one day to enable a standard late inspection of the shuttle heat shield to occur while the shuttle is docked to the International Space Station. The second EVA was performed by Richard Mastracchio and Clayton Anderson on April 11, 2010 (7h 26m). 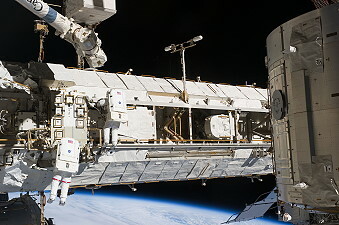 Using the station's arm, the astronauts removed the empty ammonia tank from the station's truss and temporarily stowed it on an equipment cart. The new tank then was installed and connected to the truss for use. The astronauts than ran into problems bolting the 1,700-pound (771 kg) structure down, however, put the astronauts well behind schedule and caused Mission Control to postpone hooking up the fluid lines to the new tank until a future EVA. Finally, after multiple attempts over an hour and a half, Clayton Anderson drove a recalcitrant bolt home to clear the problem. The station's arm then temporarily stowed the old tank on another part of the station's structure until the mission's third spacewalk. 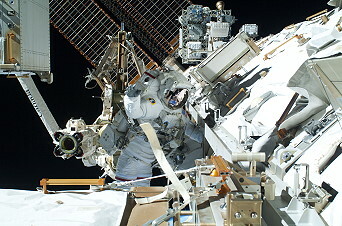 Richard Mastracchio and Clayton Anderson began the second spacewalk at the site of the spent ammonia tank assembly on the first segment of the station's starboard truss. Clayton Anderson disconnected two electrical cables. Then he and Richard Mastracchio worked together to release the four bolts holding the assembly in place, lifted it off of the station's truss and handed it to the robotic arm. Richard Mastracchio then moved a crew and equipment translation aid cart - or CETA cart - into place to provide temporary storage for the old ammonia tank assembly. When the assembly arrived via robotic arm at the CETA cart via robotic arm, the spacewalkers tied it to the cart with six tethers. That freed the robotic arm up for the installation of the new ammonia tank assembly. While it was retrieving the new assembly from the mobile transporter system, Richard Mastracchio and Clayton Anderson took advantage of the time by installing two radiator grapple fixture stowage beams on the first port segment of the station's truss. These beams were used temporarily to store handles that would be necessary if a radiator ever needed to be replaced. By the time they were done with that, the new ammonia tank assembly should be in place. Richard Mastracchio first removed the handle that allowed it to be stored on the mobile transporter. Then he and Clayton Anderson worked together to install it, engaging four bolts and connecting six cables. Clayton Anderson and Richard Mastracchio ran into a small problem when one of the four bolts that holds the tank in place wouldn't turn. They loosened the other three and tried them all again and the fourth bolt was successfully tightened. The two spacewalkers helped guide the SSRMS to temporarily stow the old ATA on the truss structure. The new ATA had its electrical connections made, but the fluid connections were deferred until the third spacewalk since the EVA was behind the time-line. The third and final EVA was conducted by Richard Mastracchio and Clayton Anderson on April 13, 2010 (6h 24m). First they finished the complicated change out of the large ammonia tank assembly. Using the station's arm, the crew moved the old tank into the shuttle's payload bay for return to Earth. The spacewalkers also removed the grapple bar from the old ammonia tank and stowed it on a spare parts platform. Finally Richard Mastracchio and Clayton Anderson retrieved debris shields from the Quest airlock to return to Earth. Due of the delays, the planned installing a plate and camera light on the Dextre robot, the removal of thermal covers on Dextre and replacement of a burned out light on a truss camera were not carried out. Meanwhile, engineers on the ground started to troubleshoot a stuck valve in a nitrogen tank assembly that's needed to pressurize a new ammonia tank installed on the space station by Discovery's astronauts. The ammonia tank was installed during three spacewalks by Mission Specialists Richard Mastracchio and Clayton Anderson. 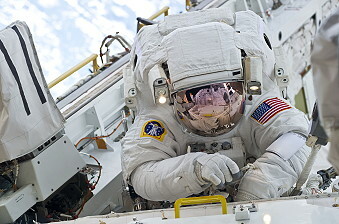 Following some discussions the flight controllers have decided not to add a possible fourth spacewalk plus an additional one-day mission extension to the shuttle Discovery's mission to replace a nitrogen tank in the International Space Station's ammonia coolant system, concluding the system can safely operate for an extended period despite a stuck valve preventing normal pressurization. 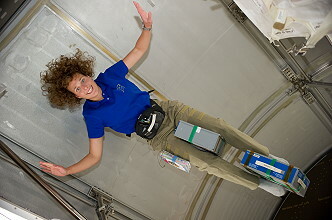 On April 15, 2010 Stephanie Wilson and Naoko Yamazaki using the space station's robotic arm packed the Leonardo Multipurpose Logistics Module back into Discovery's cargo bay for return home. The Leonardo cargo module was detached from the International Space Station late after a lengthy delay. It was parked overnight in a "low hover" position just above the shuttle's payload bay and the astronauts completed the installation next day morning. The operation to move the Leonardo Multi-Purpose Logistics Module (MPLM) from the International Space Station back to space shuttle Discoverys cargo bay for return to Earth has been delayed due to a problem with the mechanism that holds the MPLM in place. 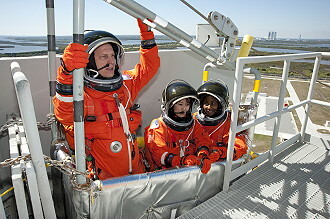 Next Stephanie Wilson, Dorothy Metcalf-Lindenburger and Discovery Pilot James Dutton teamed up to begin the late inspection of the shuttle's thermal protection system. Working in shifts with some help from Commander Alan Poindexter and Naoko Yamazaki, they used Discovery's robotic arm and the orbiter boom sensor system to look at reinforced carbon-carbon of the wing leading edges and the nose cone, as well as and the heat-resistant tiles. The inspection, scheduled for about seven hours, was finished almost three hours ahead of schedule. 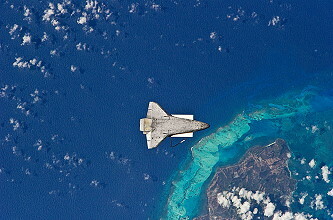 It was done while the shuttle was still docked so the images could be sent down by the station's high-data-rate system. Discovery's high-data-rate Ku band antenna was not working. Once the shuttle was about two feet (61 centimeters) from the station and the docking devices were clear of one another, James Dutton turned the steering jets back on and manually controlled Discovery within a tight corridor as the shuttle separated from the station. Discovery moved to a distance of about 450 feet (137.2 meters), where James Dutton began to fly around the station. James Dutton circled the shuttle around the station at a distance of 600 - 700 feet (182-213 meters). Once the shuttle completed 1.5 revolutions of the complex, James Dutton fired Discovery's jets to leave the area. The shuttle began to increase its distance behind the station with each trip around the earth while ground teams analyzed data from the late inspection of the shuttle's heat shield. However, the distance was close enough to allow the shuttle to return to the station in the unlikely event that the heat shield is damaged, preventing the shuttle's safe re-entry. Due of bad weather in Florida the landing was delayed one day.